In the Davidic kingdom, the mother of the king held an official position in the royal court, in which she shared in her son’s reign and served as an advocate for the people and a counselor for her son. The queen mother was also associated with two key Old Testament texts, bound up with Israel’s messianic hopes. The prophecy of Isaiah 7:14 involves the sign of a queen mother who will conceive and bear the future Davidic King, Immanuel. The queen-mother figure also may appear prototypically in Genesis 3:15, which also associates a mother with her royal offspring in a context that has important Davidic kingdom overtones. With all this background in mind, we are now prepared to examine how Mary, the mother of the Davidic King par excellence in the New Testament, can be understood in light of this queen-mother tradition of the Old Testament. Just like her Near Eastern neighbors, Israel bestowed great honor upon the mother of the ruling king. Roland De Vaux notes how the queen mother was given a special preeminence over all the women in the kingdom of Judah, even the king’s wife. He highlights the fact that although one particular woman from the royal harem usually held the king’s preference, “the king’s favor was not enough to give this wife official title and rank.” This is seen in the fact that throughout the entire Old Testament, the word queen (feminine form of melek, or “king”) is used only once in association with Israel, and even there it is used primarily poetically, not politically. On the other hand, the prestigious title gebirah was used often in the Old Testament to describe the mother of the king. Meaning “mistress,” “great lady,” or “queen,” gebirah is the feminine form of gebhir (“lord” or “master”). De Vaux notes how the term corresponds to adon (Lord), the feminine of which is not used in Hebrew. In the Old Testament, gebirah is often used as a title for the mother of the king, but it is never used to describe the wife of an Israelite king. In Matthew 1–2, Mary is portrayed in the queen-mother tradition. Matthew examines Mary’s position alongside her royal Son when the magi pay Him homage (Matt 2:11). As mentioned above, this scene involves a number of Davidic kingdom themes: Jesus is called the “king of the Jews” (2:2). The star guiding the magi recalls the star in Balaam’s oracle about the royal scepter rising out of Israel (Num 24:17). The narrative centers on the city of Bethlehem, where David was born (1 Sam 17:12) and out of which the future Davidic King would come (Mic 5:2). And the magi bringing gifts and paying the child Jesus homage recall the royal Psalm 72:10–11 (cf. Is 60:6). In the act of adoration of the magi, St. Matthew, a good expert on the Davidic traditions, thinking of the readers of his gospel, does not omit the significant detail of showing ‘the child with Mary, his mother.’ In this way, he associates and confirms Mary as the gebirah of the messianic kingdom. Moreover, it is she who enthrones and presents the king-Messiah to the adoration of the magi, exercising one of the specific missions of the gebirah. In conclusion, we have seen how Matthew clearly places his infancy narrative in the context of the hopes surrounding the Davidic kingdom. Interpreting Mary with those Davidic traditions in mind, we can see that, as mother of the newborn Davidic heir, she could be understood as a queen mother. Indeed, we have seen how the queen-mother tradition can illuminate Matthew’s narrative presentation of Mary, shedding light on her being linked with the queen mother and Immanuel prophecy of Isaiah 7:14, frequently associated with her royal Son in Matthew 2, and placed on the regal stage beside her royal child as the magi pay Him homage (while the generally more central Joseph is not even mentioned). 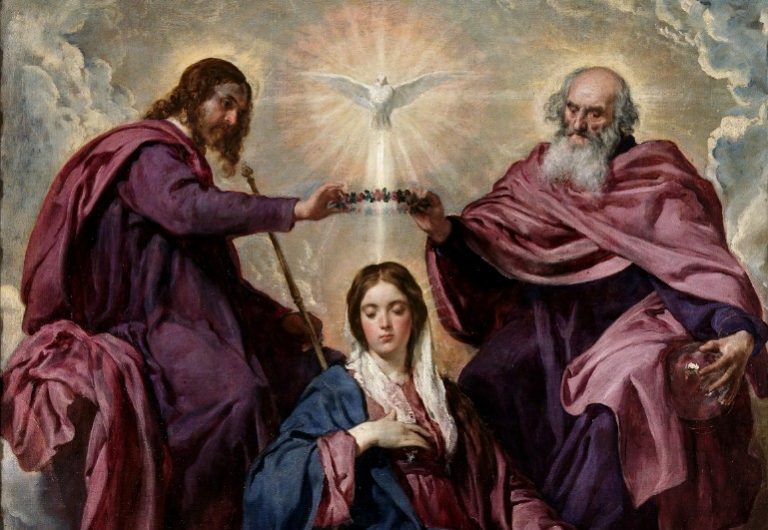 Thus, we conclude that the queen-mother tradition can be a helpful background for understanding Mary, the mother of the newborn Davidic King, in Matthew 1–2. Dr. Edward Sri is professor of theology and Scripture at the Augustine Institute’s Master’s in Catechetics and Evangelization program in Denver, Colorado. He is the author of numerous books, including Queen Mother: A Biblical Theology of Mary’s Queenship, which explains the firm foundation of Marian dogma in Scripture.